BATON ROUGE, La. 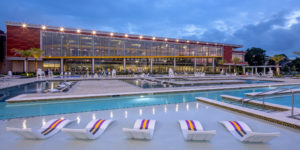 — Louisiana State University (LSU) in Baton Rouge recently completed a new student recreation complex (UREC) after five years of work on the project. The new student recreation complex supports LSU’s vision for an expanded on-campus complex that hopes to inspire personal wellness for the student body. 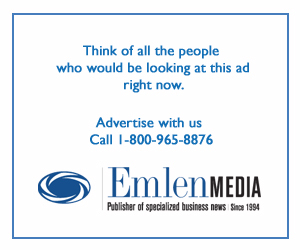 The design team began work on the project in June of 2012 and completed it earlier this year in March. HOK in Kansas City, Mo., and Grace Herbert Architects in Baton Rouge were the architects on the project, with Milton J. Womack Construction in Baton Rouge serving as the general contractor. The budget for the project was $62 million, which included three separate projects: an outdoor recreation field complex, the UREC tennis court and parking addition as well as the main UREC building project — a 257,000-square foot building, which includes an outdoor swimming pool. The new complex offers 40,430 square feet of cardio and weight room space as well as six group fitness studios. 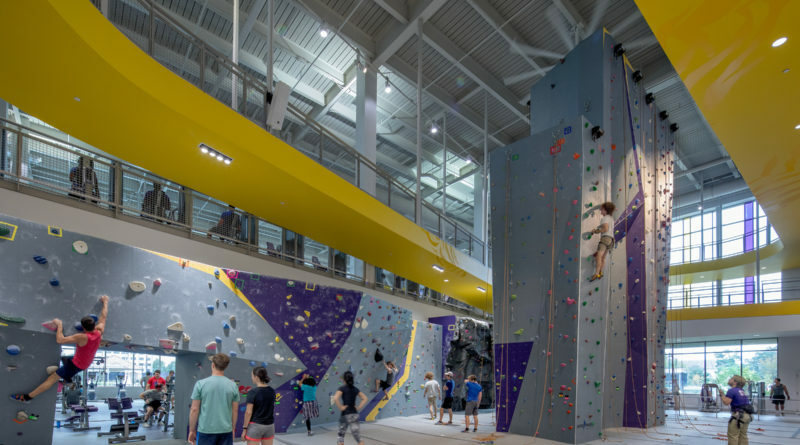 In addition, the new student recreation complex has a 38-foot-high climbing wall and bouldering area, five renovated gymnasium courts, three MAC gyms and a functional training area. There is a lengthy indoor elevated track (one-third of a mile long) that was designed to “wind through the space like an LSU Tiger tail” that also incorporates a sprint incline connecting the track to the functional fitness area. The new outdoor swimming pool has six fitness lap lanes and an outdoor leisure pool that includes a current pool formed in the shapes of the letter forms of “LSU,” which School Construction News reported on back in August. In addition, the existing indoor 25-meter lap pool was renovated as part of the UREC project. The multi-phased project also included the relocation of outdoor recreation fields for student intramural and club sports to a new off-campus site. The primary goal of building the new complex included the expansion of facilities to meet the current needs of the student body and “to elevate LSU above its peer institutions in the SEC,” according to Doug Barraza, senior project manager and vice president for HOK’s Sports, Recreation and Entertainment practice. Additionally, the school wished to expand its outdoor fitness space by offering cardio, strength, weights and functional fitness options while also providing a new outdoor pool facility — which was the top priority identified by students in a survey they completed, according to Barraza. While the project team did not pursue LEED certification, the complex’s form and layout maximizes daylight, frames outside views and integrates open-air spaces with exercise terraces, outdoor aquatics and interior courtyards, making strong connections between indoor and outdoor spaces. In addition, locally sourced materials, low flow fixtures and ample outdoor space were employed to create a healthy environment for students.